We have developed plugins for WordPress and Drupal, so enabling Token2 for your site is just a matter of installing a plugin. You only have to install a plugin and add your site's API key on plugin's settings page. Please note that the plugin below is to be used with Token2 API only. If you plan to use a self-hosted authentication system with Token2 hardware tokens, you need to use Token2 Hardware Tokens plugin instead ! 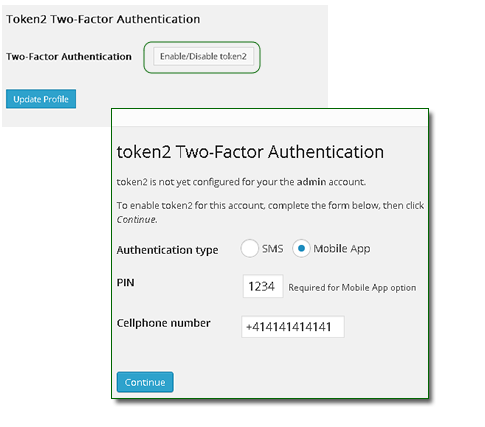 Token2 is a hosted two-factor authentication service. 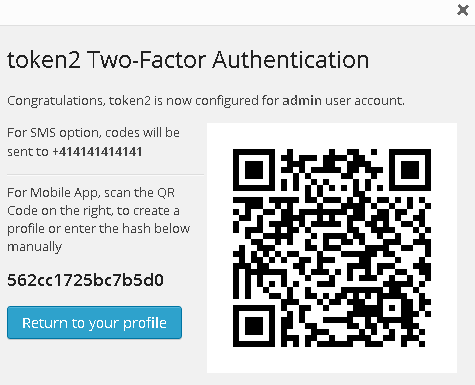 Using the Token2 plugin you can enable two-factor authentication for all your WordPress users in a few clicks. The plugin has been tested with Wordpress 3.8.0,3.9.0, 3.9.1 and 4.2.2. 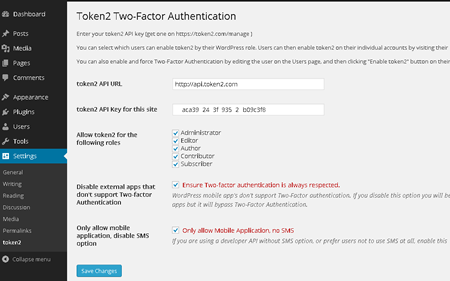 To enable Token2 two-factor authentication in your WordPress, follow the steps below. 1. Download the installer package from this link or search in the plugins directory on your Wordpress admin panel. 2. Install and activate "token2" in the list of WordPress plugin. 3. 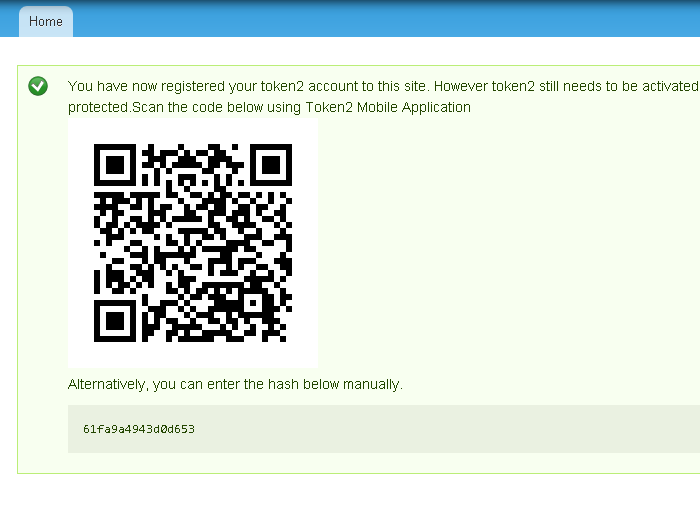 Create a site in your Token2 control panel. 4. Go to token2 plugin settings and enter API key generated on the previous step. 6. Instruct or force your users to enable Token2 on their profile settings. Users can self enrol using a button that appears on their profile page once the plugin has been installed and configured. 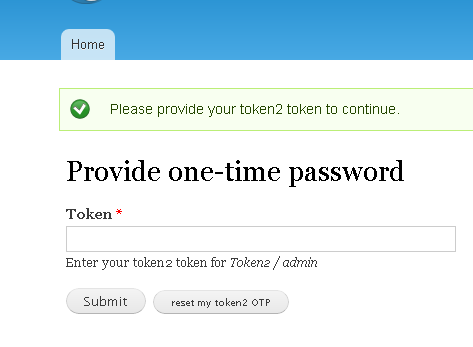 Upon enrolment, users are instructed to create a profile in Token2 Mobile OTP if Mobile App option was selected. If you have chosen to force Token2 for a user, the enrolment form will appear on user's next login. The plugin has been tested with Drupal 7.26,7.27,7.28 and 7.37. 1. Download the installer package from this link. 2. Install and activate "token2" in the list of modules. 4. 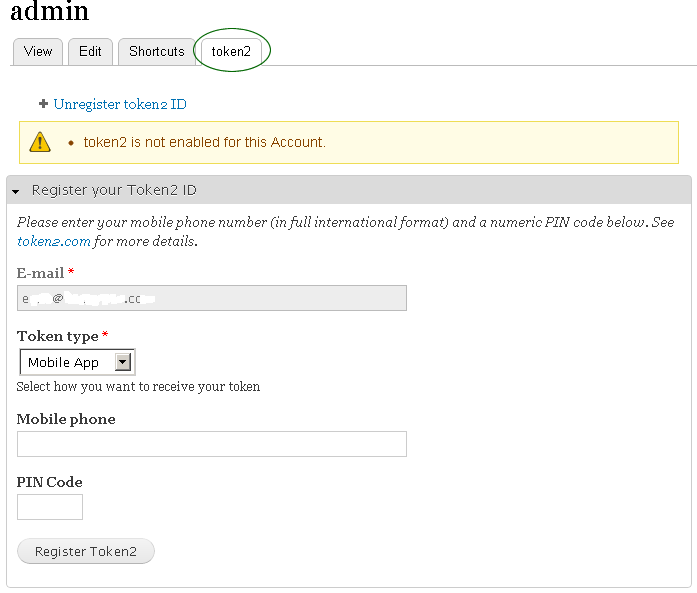 Click on Configuration of the token2 Module and enter API key generated on the previous step. Users will have an additional "token2" tab on the profile page. Upon completion, a QR code for Mobile App option will be displayed. 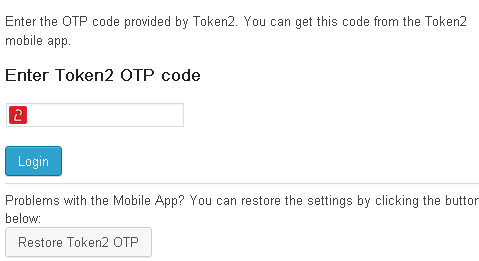 To enable Token2 for the account, the OTP (one time password) sent by SMS or generated by the Token2 Mobile OTP application needs to be provided. Once activated, users will be requested to provide the second factor (OTP) in order to access member area of Drupal. If you are using a different CMS, you may want to have a look at Token2 API documentation and API Samples.